Received: November 9, 2018; Revised: November 26, 2018; Accepted: November 26, 2018; Published online: January 31, 2019. The origins of surgical interventions on humans are older than the development of clinical medicine. The corporal barrier was broken long before ancient minds became aware of the profound wisdom of not breaching it. To eliminate what was clearly anomalous, such as a tumor, a growth, a festering wound, a broken limb, or a persistently painful tooth, involved a swift medical decision that offered a quick solution to a problem and did not require profound knowledge or special care. Surgery was slow to lose its characterization as a minor, subsidiary technique, and its status as a craft. Ambroise Paré (1510–1590) gave surgery a more appropriate technical base. Among other therapeutic measures, he stopped burning wounds to improve their condition. As far as surgery’s path to professionalization was concerned, Paré could not have been better placed. He came from a family of barbers, and his work prompted the final break of surgery away from their trade. Surgery’s gradual transformation into a medical specialization rapidly accelerated in the second half of the twentieth century, due to technological developments that allowed for constant improvements in the diagnosis and treatment of various pathologies. This article poses some questions and reflections about the image-guided surgery (IGS) in the midst of this technological whirlwind. I shall attempt to explain my vision about the path being followed by surgery, knowing full well that there will be as many visions as people addressing the issue. “In tomorrow’s world,” wrote Laín Entralgo, “What will happen with surgery?” Two utopian visions exist in the medical profession in answer to this question: the first predicts that preventive medicine and pharmaceutics will make such progress that they will stop disease from arising in the first place, or at least from developing into a “surgical stage”; the second envisions such a degree of refinement in surgical techniques that surgery will become not only a valid means of curing disease or creating a better functional state than morbidity, but that it will also improve chances of staying healthy. In other words, we are looking at the disappearance or the transfiguration of surgery. Other SectionsBackgroundWhat Is Then Percutaneous IGS?High quality imagesArtificial intelligenceData-driven medicineHow Can We Get Ready for the Percutaneous IGS?ConclusionConflicts of InterestFiguresTablesReferences What Is Then Percutaneous IGS? Percutaneous IGS are procedures that are performed through the skin by minimal incision, guided by images and involve artificially intelligent (AI), robotic, data-driven, mixed reality, navigation systems and advances in image quality, image fusion and target location. These developments will also require surgeons (or whoever performs these techniques through the skin), to acquire various non-technical skills, centered mainly on teamwork and the exercise of new leadership styles. In this way, we can say that IGS is the evolution of MIS. At the end of the last century, MIS allowed us to add something fundamental after diagnosis and before treatment: The possibility of “choosing the tool.” Before this, we only had open surgery, and with the arrival of MIS (laparoscopy, interventional radiology, and therapeutic endoscopy) we were able to choose what was best treatment for our patient. Now with the new technologies, we can do much more. We propose that today you can and should perform 8 steps listed in Table 1. In recent years we have witnessed a significant increase in the use of high quality images in percutaneous surgery (improved image quality, image fusion, mixed reality, and navigation systems). This allows a combination of image-guided procedures, making them safer and less invasive by refining existing techniques. 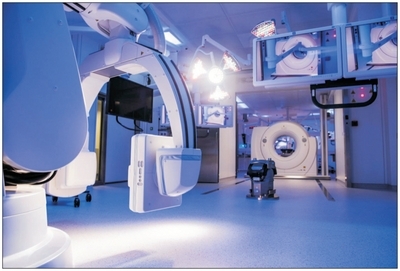 To this end, we are seeing the construction of so-called hybrid operating rooms (Fig. 1). Image fusion technology and augmented reality, which allows for the combination and overlap of intraoperative and postoperative images (MRI, CT, or positron emission tomography [PET] scans) as well as three-dimensional reconstruction, makes surgery safer and provides a more accurate guide as to where to puncture or cut (Fig. 2). These are the ways in which true IGS will allow us to perform more precise, less aggressive procedures, causing less functional disruption and improving postoperative quality of life. Technology is not only “nice” or the latest trend in a marketing strategy, it makes operations safer for patients and will increasingly have an impact on surgical results. The near future of IGS will be the use of AI, which is defined as intelligence shown by machines. In computing, an ideal “intelligent” machine is understood to be a flexible rational agent that detects its surroundings and takes actions to maximize its chances of success in achieving a goal.4 The term AI is commonly used when a machine imitates cognitive functions that humans associate with other human minds, such as learning and solving problems. Thus some new computers are described as cognitive or AI computers. For example, there is Watson, IBM’s new cognitive computer, which is a type of AI expert system. Watson, named after IBM’s first president, can store more medical information than any individual human being, and can give answers to the natural language of surgeons in a matter of seconds. These AI machines will become intelligent surgery assistants. Evidence-based decisions are normally undertaken to obtain competitive advantage. A study carried out by the Center for Digital Business at MIT (Massachusetts Institute of Technology) found that organizations driven by data-based decision making were 4% more productive and 6% more profitable. However, integrating massive amounts of information from different areas (a common occurrence in medicine these days) and combining them to obtain actionable data in real time (necessary in surgery) can be very complex, and errors made in the process may cause serious problems. For this reason, the use of data in decision making (data-driven decision making) in conjunction with AI and robotic technologies may lead to a reduction in the number of problems encountered. Other SectionsBackgroundWhat Is Then Percutaneous IGS?High quality imagesArtificial intelligenceData-driven medicineHow Can We Get Ready for the Percutaneous IGS?ConclusionConflicts of InterestFiguresTablesReferences How Can We Get Ready for the Percutaneous IGS? The traditional idea that “surgeons operate and the other specializations diagnose” no longer holds.5 Over the second half of last century, increased technological innovation has led to the development of new ideas, methods, and equipment (MIS). As a consequence, the boundaries between medical specializations, as Pellegrini has argued, have begun to blur. The notion of distinct medical departments (Surgery, Clinical Medicine, Radiology, etc.) is a structure that fit nineteenth century requirements, but it is unproductive in relation to the needs of the twenty-first century. The concept of multidisciplinary teams has been developed in order to correct this. Far from solving the problem, the development of these teams has shown the increased need to spend time with those who treat the same conditions regardless of our background. An hour a week is not enough; we need to be in contact on a full-time basis. The traditional idea of meeting and working as a group in terms of “who we are,” following the departmental logic, is shifting toward the idea of teams that work together on the basis of “what and who we treat.” Centuries of egocentric behavior are being pushed aside in favor of true teamwork focused on patients and their problems. Nonetheless, implementing the changes associated with these innovations often presents a difficult challenge for doctors and other health professionals, given the power structures they work in and the privileges they wish to maintain. Moreover, the same society that used to demand quality and safety in daily medical practice, now additionally requires keeping costs down while still obtaining good results. Not even the best surgeon can meet these four requirements working alone. This is why teamwork working under the guidance of modern leadership is necessary. By modern leadership I do not mean the traditional authoritarian leader, but a leader who will foster exceptional communication, mutual respect and support, and who will develop the direct means to fulfill our mission, which is none other than improving the health of our patients. Many surgeons think that they work as a team when they actually only work in a group. In a work group, members have similar training and do the same type of work without complementing each other. In these groups, each person has individual responsibility. On the other hand, in high-performance teams every team member is an expert in a specific area and is jointly responsible for the work done. This requires the establishment of common performance standards and the need for coordination. This is why cohesion is fundamental in teams, as is close collaboration among members. Many studies6 have shown that failure to work as a team increases costs and complications in the operating room. In contrast, good teamwork produces better technical results. Additionally, respect for and the pursuit of team diversity (which in the past was taken as an obstacle) is inescapable. Work teams nowadays must foster and encourage differences among team members. The more multifaceted professionals are, the greater the capability of the team to achieve success. Diversity facilitates innovation. If we all think the same and behave in the same way, we may well find ourselves in our comfort zone, but we are unlikely to innovate. In this line of reasoning, innovation is understood as the necessary foundation on which to create and adopt new technologies, which as we have seen are at the center of surgery’s future. At the end of the day, although technology will dominate surgery in the future, whether we surgeons are able to adapt to and make the most of the changes or find ourselves gradually nudged out of the picture will depend on how we position ourselves in relation to the profession itself and its surrounding context. As always, opportunities do not present themselves from the outside, but emerge from within. We are facing the change of an era, rather than an era of change. As J. Marescaux suggests,3 the concept of general surgeon will become increasingly obsolete, to be replaced by the minimally invasive surgeon and complement now with image-guided surgeon. On the other hand, we are facing continuous technological advancement, sometimes accompanied by pressure from companies. We must work together to optimize results, accepting and adapting what is beneficial and leaving aside what doesn’t represent true progress. What must not change is our perception. We have gone from thinking that a good surgeon was the one who made a large incision to thinking that it was the one who made smallest one. We come from a past filled with an abundance of great teachers and now it seems there is no one to lead us. None of this is true. The size of a wound does not make a good surgeon, and there are leaders, but we must seek them out because they are not going to come and knock on our doors. The generational change that we observe and which terrifies us at times is actually an opportunity and is fundamental in order to assimilate and channel technological progress to the benefit of our patients. The young people who join our teams contribute to the building of a less formal vision, in which respect for professional values replaces a certain authoritarianism. They teach us older surgeons, as do social networks, the concept of shared information as the basis for participation. But the leadership of these teams is in our hands as senior professionals. Let’s not say then that there is nothing we can do, because the future is in our hands. I agree with Giménez2 when he says that the future of humanity lies not with children but with adults. Children and young people must work and coexist with adults, and are transformed by adults as they interact with them. This is a huge responsibility. Today’s adults—what we do, what we choose, what we think—are the future of humanity. HQ, high quality; MRI, magnetic resonance imaging; CT, computed tomography. Palermo M, Gimenez M, Gagner M. Laparoscopic gastrointestinal surgery novel techniques, extending the limits. Caracas: Amolca 2015. Giménez M. What is the future of surgery?. In: Chu QD, Vollmer CM, Zibari GB, Orloff SL, Williams M, Giménez ME, editors. Hepato-pancreato-biliary and transplant surgery: practical management of dilemmas. Shreveport: Beaux Books Publishing 2018:1127-33. Pessaux P, Diana M, Soler L, Piardi T, Mutter D, Marescaux J. Towards cybernetic surgery: robotic and augmented reality-assisted liver segmentectomy. Langenbecks Arch Surg. 2015;400:381-5. Bostrom N. Superintelligence: paths, dangers, strategies. Oxford: Oxford University Press 2014:352. Pellegrini CA. The future of surgery and surgeons. Cir Esp. 2015;93:133-6. Lingard L, Espin S, Whyte S, Regehr G, Baker GR, Reznick R, et al. Communication failures in the operating room: an observational classification of recurrent types and effects. Qual Saf Health Care. 2004;13:330-4.